I may have gotten a bit carried away when I saw the light at the end of the wedding prep tunnel. Yep, my daughter got married last weekend- photos will be coming. So, in my excitement at not having as much to do, I joined several knit-alongs and make-alongs online. 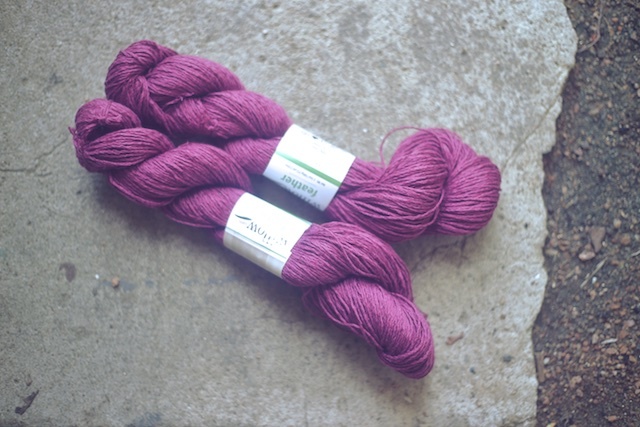 You may remember I joined the Purposeful Stash-along with Dani of Little Bobbins quite a while back. It will be going on through the Fall, so I don't feel in a rush to get to the sleeves of my Pomme de Pin just yet. Isn't it gorgeous, though? I know, you can't see the little pineapple lace stitch and even the color is off due to instagram filters, but still... five skeins of Gynx Yarns goodness. Trust me when I say, it's heavenly. If I set it aside, it will be to finish my Morning Mist tee. It was also part of a KAL, the aptly named Morning Mist Knit-along, hosted by Annie (thisbirdknits on Ravelry). This one I did not finish in time, but I still can include it in my Handmade Fashion Challenge 2015 collection that I just posted about. When that's off of my needles, I'll be moving on to a different summer top, Beach House by Teresa Gregorio, for the Holla Knits Summer KAL. 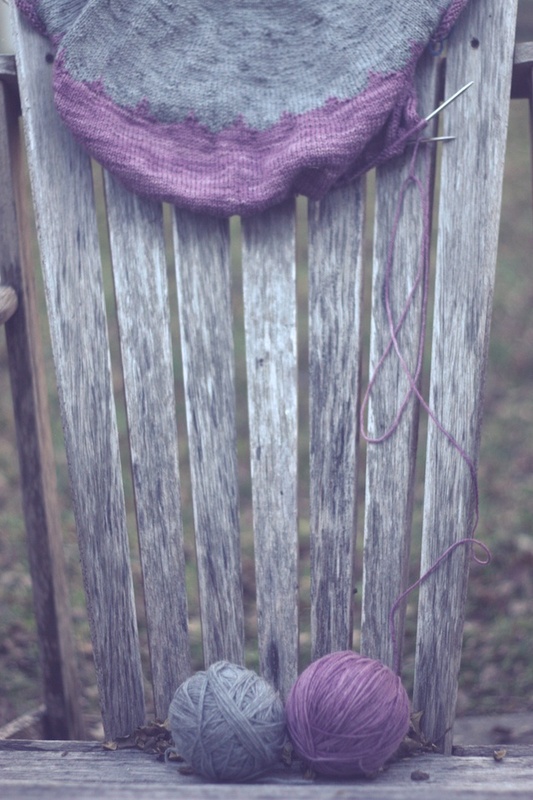 I've got some linen/cotton blend in a great fuchsia color for this. I think it will look really cute over a dress, like this one from Seamly. I got it in their end-of-summer sale and am excited to pair the two together. So once Morning Mist and my current test knit are off of the needles, I'll be able to focus on Beach House and the WIP I'm finishing for the Summer Sweater KAL, Drift's Ridge. That's right, the SSKAL, with the Very Shannon group, has already begun and I haven't even mentioned it on my blog. I haven't even started working on my project for it. And, I haven't even been blogging. Anyway, this was the first KAL I think I ever participated in and has a special place in my heart. It was like my gateway drug into the world of knit-alongs. Since the recent events in my family life seem to be calming down, I thought it would be the perfect opportunity to get my WIPs finished. Remember Drift's Ridge? It was, and is, lovely. But I lost my handle on the gauge after finishing the colorwork and it grew too much at the bust. So, I ripped it back and loaded it onto needles a size smaller. Only, I got into some other things and it languished. 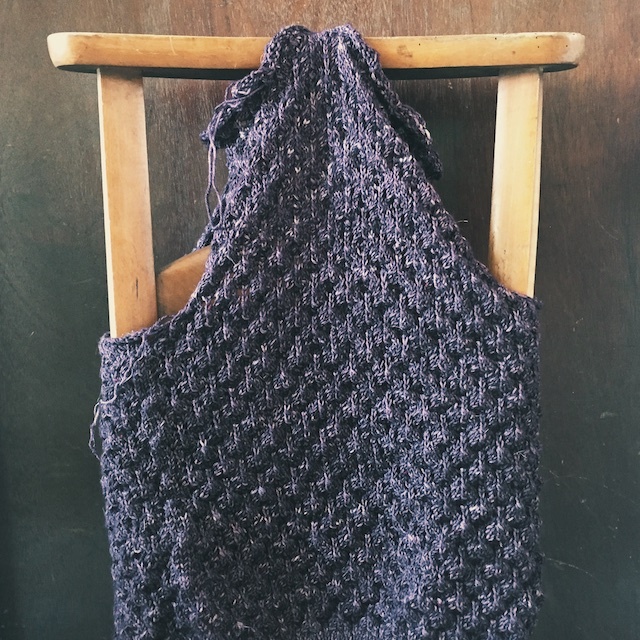 It's a shame because it will be great tv knitting from this point forward and the yarn is one of the nicest budget friendly (when bought on sale) yarns I've ever used- Valley Yarns' kettle dyed Charlemont. I realized today that both Beach House and Drift's Ridge are designs by Teresa Gregorio.